There are plenty of reasons why you should look consider renting short term storage Columbus Ohio. Perhaps you are moving and you don’t have a place to keep all of your belongings. Or maybe you are doing a home renovation so you need temporary warehouse space to clear out your house during remodeling. No matter the reason you are looking for short term storage in Columbus Ohio, Zippy Shell Greater Columbus is your best ally when you are choosing how and where to store your belongings. With our storage units Columbus Ohio, you can store your items in short-term or long-term storage. Our temporary storage warehouse offers you easy access and a friendly staff. We are here to offer you help when you need it. What are the options our temporary warehouse space offers? Here is a list of storage services Columbus Ohio you can count on. 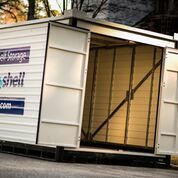 Zippy Shell provides flexible month-to-month storage leases. With our storage units in Columbus Ohio, you can store your items in short-term or long-term storage. No matter of the lease you choose, Zippy Shell can accommodate your extra space needs. Our warehouse buildings are designed to help you conveniently access your storage space. This convenience as another way to ease your life. You can come and go whenever you want, to add and remove items as you require. Besides affordable price, convenient access, and the right size of the storage unit, Zippy Shell offers friendly storage staff. We are always at your disposal, always available to answer any questions you have. Our friendly storage staff is always ready to assist you with your temporary warehouse needs. We can assist you to pack, move and store all of your belongings. With many convenient storage locations, our warehouse facilities have a storage location near you. For extra storage information and to rent your short term storage Columbus Ohio, give us a call or visit any of our local storage facilities. What should you know about short term storage Columbus Ohio? Short term storage Columbus Ohio is a storage solution where you can store your belongings for three months or less. If you are in need of temporary warehouse rental, with Zippy Shell short term storage units you can choose the type and size of the storage unit you need. The size and type depend only on the items you intend to store in your unit. With our friendly storage staff, you can easily explore our storage facility to find the best fit for your needs. When you need temporary warehouse solutions? 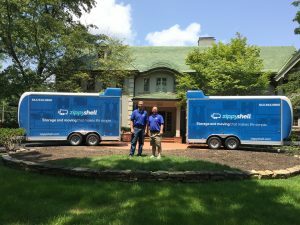 Whether you are between two homes and moves, or you are restoring your home, or the Mother Nature has forced you to move your items to temporary storage units in Columbus Ohio, Zippy Shell is here you to offer you a solution that is perfect for your needs and budget. With many convenient storage units, our services are adapted to all your requests. We understand why people need temporary storage and how it is important for them. That’s why we have a network of satisfied clients who are always returning to our services and store every time they need to do it. You should consider renting a storage container that you can keep in your driveway while renovating your home. How much space your items require? When you want to choose the right size storage unit, there are many factors involved in choosing your best-fit storage solution. No matter you need short or long term storage unit, our temporary warehouse facilities offer a range of unit sizes. So, when you are booking, you should have an idea of how much space you’ll need. So we can offer you a storage unit that is not too small or too large for your belongings. Take a look at your belongings and make sure to consider the size and shape your boxes. To pick the right size storage unit in Columbus Ohio, you should know the exact size of items you’ll be keeping in the temporary warehouse. Our storage representatives are always available to give you information and help when you are choosing the right storage unit. How to pick the right Storage location? 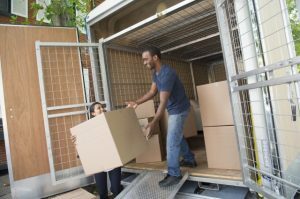 Depending on the reason you need short term storage in Columbus Ohio, you may want to rent a storage unit that is near you. You want easy access to your belongings especially if you are renovating your home. In this case, maybe you should consider renting a storage container that you can keep in your driveway while renovating your home. In this way, you can easily pull and store the items as you need them. But, in case you don’t need your items on regular basis, you can rent short term storage units Columbus Ohio that is not located a few minutes away. 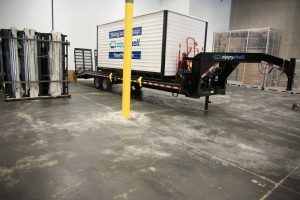 With Zippy Shell, you can rent temporary warehouse solutions that allow you easy access to your belongings, every day and hour. Also, you can count on drive-up storage access so you can easily load and unload your container. Some of our temporary warehouse facilities are more flexible with access than others. So, whenever storage unit you choose, be sure that can fit your needs, budget and location. We can offer you a storage container that is not too small or too large for your belongings. Cost efficiency as our trademark! Cost efficiency is something that we offer to our clients. So, it is not surprising why we have a network of satisfied and happy clients. Besides great locations, friendly staff we also offer affordable prices. You can easily store your most precious items without breaking the bank. When you research storage companies, you will soon find out that we are one of them that can keep your costs down. We are a storage company that specializes in temporary warehouse solutions, same as long-term storage. We have the most convenient pricing formula for our clients. Zippy Shell wants to provide you with affordable and convenient short term agreements. We are here to give you the best possible deal you can get in Columbus Ohio! Why hiring different moving company and warehouse, when you can have it all in the same place? Zippy Shell is a storage company that offers you great moving services, too. We are more than capable to provide you with the best temporary warehouse rental when moving. Our friendly staff is trained to load, move and store your items with utmost care. If you are in need for short term storage unit in Columbus Ohio when you are in between moves, our staff will take your items out of your old home, store them for a time you need, and then off-load them at your new home when you’re ready to move in. You can be sure you are renting a short term storage unit through a dedicated warehouse facility. Hiring our movers and renting our storage units is the most time and cost-effective way to guide your move. Instead of hiring movers for the move and renting storage units somewhere else, with Zippy Shell you can have it all for an affordable price! Zippy Shell is a storage company that offers you great moving services, too. Our friendly staff is trained to load, move and store your items with utmost care. Sometimes you don’t know the exact time you’ll need your short term storage Columbus Ohio. This is especially possible when you have sold the old home and you still don’t have a new home where you can transport your belongings. In this case, Zippy Shell can offer you a temporary storage with a month-to-month lease. It is the most convenient option for you if you are not sure for how long you will need a storage unit. So, you will pay on a monthly basis until you are ready to take your thing out of our temporary warehouse facilities. 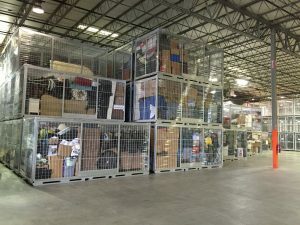 If you want to store fragile or other temperature sensitive items, be sure you can find a convenient storage unit in our temporary warehousing. We can offer you a wide range of unit amenities. You can count on climate controlled storage units where your items are completely protected from the temperature changes. These units are great if you are planning to store items during periods of extreme heat or cold. Sometimes extreme temperatures and humidity can damage certain items so you want to be sure your items are protected in temporary storage units. Storage security is our priority! Short or long term, it does not matter. When you are storing your items we want to be sure our facility is doing everything to keep them safe. We are your reliable storage facility that offers safe and climate controlled units to ensure your belongings are protected. When you want to store your items, take the safety factor of your unit into your research. Especially if you need to store high-value items, it is important to rent a temporary warehouse where you can be sure your belongings are protected. To have peace of mind, hiring Zippy Shell to store your belongings is the best thing you can do. In our warehouse, you can be sure your belongings are protected. There are lots of good storage options out there, but we are your great fit! Choosing the best short term storage solution should be done by comparing different moving and storage companies. You should compare different types of storage units to find the most reliable and the best fit for your needs and budget. There are lots of good temporary storage options out there, but soon as you make a research you will find out we are your best fit no matter your needs!